Industrial Bearings & Services wants only to ensure that you have the products you need for your mechanisms and to be certain those parts are well cared for. Our 200-plus years of combined experience means we understand better than most, exactly what you’ll need for your apparatus. Each and every one of the aforementioned products are necessary for the preservation of your mechanisms. Why? Well, when two surfaces are in constant contact, moving at high-friction rates, it usually requires a certain substance to maintain that the mechanism runs at optimum levels. 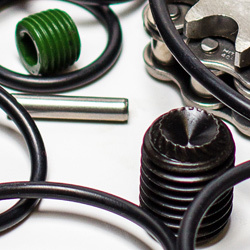 These products are created for the sole purpose of increasing friction through the use of a sealant and decreasing friction by lubricating the parts. Industry professionals often need additional products to fine-tube their equipment. This includes adhesives, lubricants, hoses, anti-seize pastes, conveyors torque limiters, and more. When each of these power transmission products is used properly, and regularly, they enable your mechanisms to perform at their peak. We, with our knowledge and expertise of the field, can walk you through precisely what you’ll need in order to keep your mechanisms in top shape. Because of how expansive our selection is, it can be difficult to understand the way each product is intended to work with your mechanism. Utilizing the incorrect product may actually be more harmful that not utilizing one at all. This is the primary reason why we make ourselves available to you through a large percentage of the week. Regular maintenance to your apparatus is a must, and not enough people understand that. Have you ever wanted to call yourself an expert in the field of industry? You may not have the knowledge or the tools now, but you can. The core of what we do here at Industrial Bearings & Services is serving the customer, making sure that you know how to take measures into your own hands and execute the adjustments and modifications to your mechanism with ease. That is one of the primary reasons that we provide redress kits to you. Contact us today. Email, call, or stop by for a visit to our Houston location, and we’ll ensure you leave with everything you want and everything you need.